Brunei’s Sultan Haji Hassanal Bolkiah will pay a state visit to China from Tuesday to Thursday at the invitation of Chinese President Xi Jinping. During his stay, the sultan will attend the opening ceremony of the annual expo, business and investment summit between China and the Association of Southeast Asian Nations held from Tuesday to Friday in Nanning, capital city of southwest China’s Guangxi Zhuang Autonomous Region. The following is a brief introduction of Hassanal. Hassanal was born in 1946 in Bandar Seri Begawan. He received high school education at Victoria Institution in Kuala Lumpur, Malaysia, after which he attended the Royal Military Academy Sandhurst in the United Kingdom. 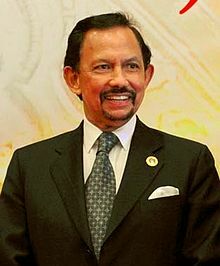 Hassanal succeeded to the throne as the sultan of Brunei in 1967. His coronation was held in August the following year. He is both the head of state as sultan and the head of the government as the prime minister. In addition, he holds the portfolios of ministers of defense, finance, foreign affairs. He is also the supreme commander of the Royal Brunei Armed Forces.